→What Are The Best Jojoba Oils For Your Health? What Are The Best Jojoba Oils For Your Health? Out of all the essential oils in use today, there are a few that are talked about more frequently than others. Jojoba oil is a part of many people’s essential oil collections, whether or not they know exactly what to do with it! This stuff is great for a whole lot of applications, except if you get poor quality oils. High quality jojoba can be mixed into special blends, used directly, or turned into a carrier oil. I want to help you learn how to get the best jojoba oils, so you don’t run into problems from poor quality oil. I just touched on a few of the uses above, but I want you to get a sense of just how versatile this stuff is. Jojoba is made from a waxy compound, so it’s a bit different from other oils on the molecular level. This is importance, because it’s one of the reasons that jojoba oil is so good for your skin. It closely resembles sebum produced by your pores, which can trigger your body to stop over-producing oils. When you use it on your face, either straight or in a blend, you can cut down on oily skin, while also adding a little bit of needed oil to keep it from drying out too much. It’s great for balancing out oils on the face and for moisturizing your body. Most people can use it on sensitive skin without upsetting a reaction. When mixed with other, stronger oils it makes them safe to apply on the skin as well by diluting the effects while keeping the main elements strong. It may not work for everyone, because people’s skin can be very different, but jojoba is one of the best facial oils you can use. Since it closely resembles sebum oil from the face, you’ll most likely be able to use it without causing acne breakouts or irritation. Mixing other oils into jojoba oil before applying them helps the oils to get absorbed better into the skin, and makes them safer for use. You can take a very strong oil like peppermint or tea tree, and by mixing it with jojoba oil you’ll be able to get the benefits without the dry skin or irritations from the stronger oils. Because of its unique molecular structure, jojoba oil is very easily absorbed by the skin. It usually absorbs more quickly than many other types of oils as well, which keeps it from building up and leaving oily residue on your face or body. Organic jojoba oil is made from organically grown jojoba seeds. There won’t be any pesticides or chemicals used in its growing or production, which means the final oil will also be free of those things. This is what you want if you plan to use the oils for facial or skin application, since those pesticides and agricultural chemicals can irritate the skin. It’s possible to get non-organic jojoba oils as well if you’re not as concerned about the possible presence of chemicals. But, you should be aware that non-organic oils may cause you to break out or get irritation on your face if you use them there. Refined oil is another way of saying it was unnaturally enhanced or changed. The best quality oils are unrefined, meaning they are raw. If you want high quality jojoba, get unrefined oil. This ensures that it’s the first batch of oil from a collection of seeds (which are sometimes pressed more than once), that it hasn’t been unnaturally modified, and that it hasn’t undergone any process that might damage the beneficial properties, such as heating. The other refinement issue you have to look out for is when two types of jojoba oils are blended together. This only happens when one is lower quality, such as from the second pressed batch, and the company wants to try to sell it as a higher quality oil than it really is. The best way to get raw, natural oil from seeds and nuts is to cold press them. This process does not involve any chemicals or excessive machinery. Chemical extraction is something you want to avoid whenever possible, since this can dilute the oils and break them down into a form that won’t be as beneficial to you. For the best quality, you need cold-pressed oils! If your oil comes and it has a foul smell, usually described as a rancid odor, it might have gone bad. Oils do have a shelf life, especially if they’re stored poorly or not packaged correctly. The odor is the easiest way to know that you have not gotten a good oil, and you shouldn’t use it. 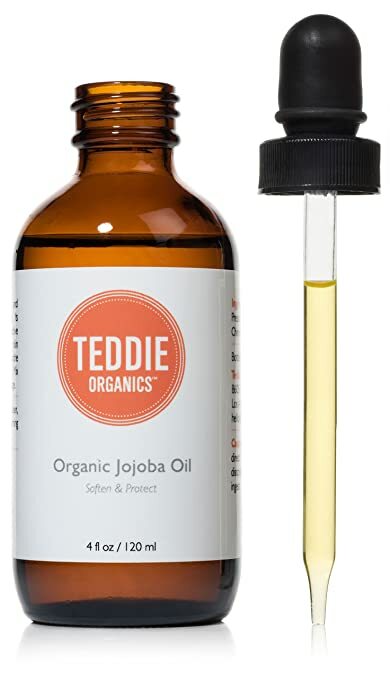 Teddie Organics’ jojoba oil is cold pressed from organically grown jojoba seeds. It’s packaged in a dark brown glass bottle with a glass dropper inside to help preserve the oils and keep them fully intact. This oil is meant to be applied in small amounts to the hair, face, or skin for great benefits. You can buy this particular oil in 4oz. bottles. It’s made from 100% pure, cold-pressed and unrefined jojoba oil. This organic jojoba oil from Leven Rose is non-GMO and it has no parabens or added fragrances. It’s made in the US jojoba seeds grown in Arizona. The oil is sold in 4oz. dark amber bottles with a long glass dropper inside. Leven Rose makes their oil through cold pressing and does not put it through any refining processes. 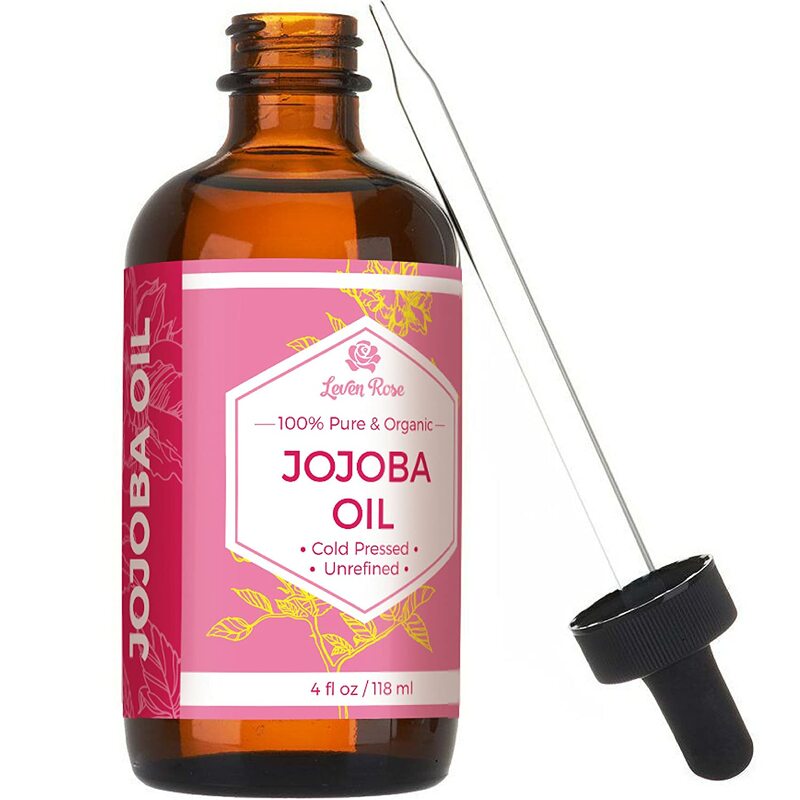 You can buy this jojoba oil in a variety of sizes, from 2oz. or 4oz. or in a set of 2 bottles of 4oz. 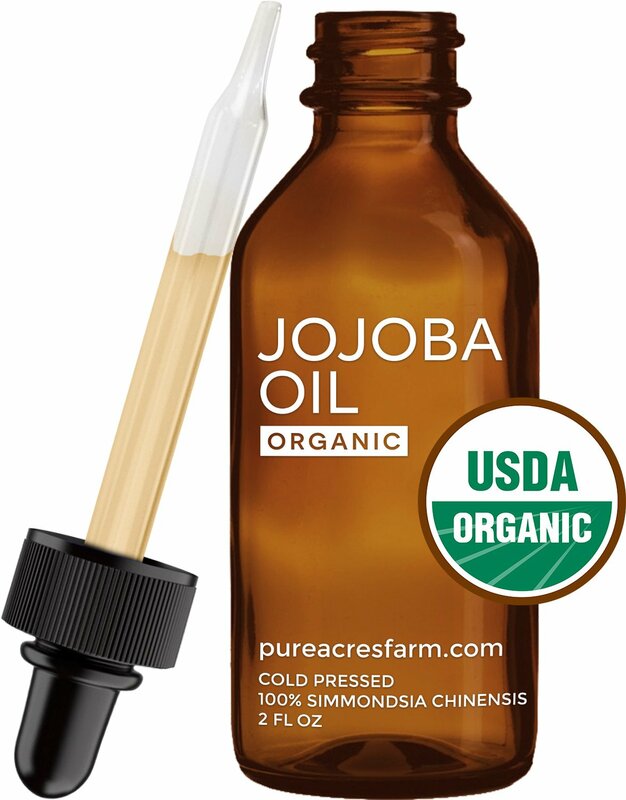 The jojoba seeds used to make this oil were grown organically and fit California’s strict Organic Food Act of 1990, ensuring that they are high quality and natural. No animal testing was done, and nothing has been added to the oil to make a blend. Desert Essence cold presses the seeds to get oil, and does not refine them before packaging. Sold in smaller 2oz. 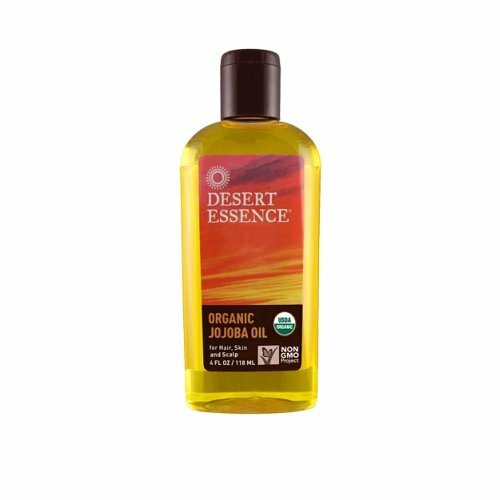 bottles, this jojoba oil comes in a dark amber glass bottle with a glass dropper for applying the oils. The company offers a 100% quality guarantee for a full refund if you are not satisfied by the product. This is pure, cold-pressed jojoba oil without any additives or mixing. It’s also completely unrefined, making it a great product for natural beauty regimens. 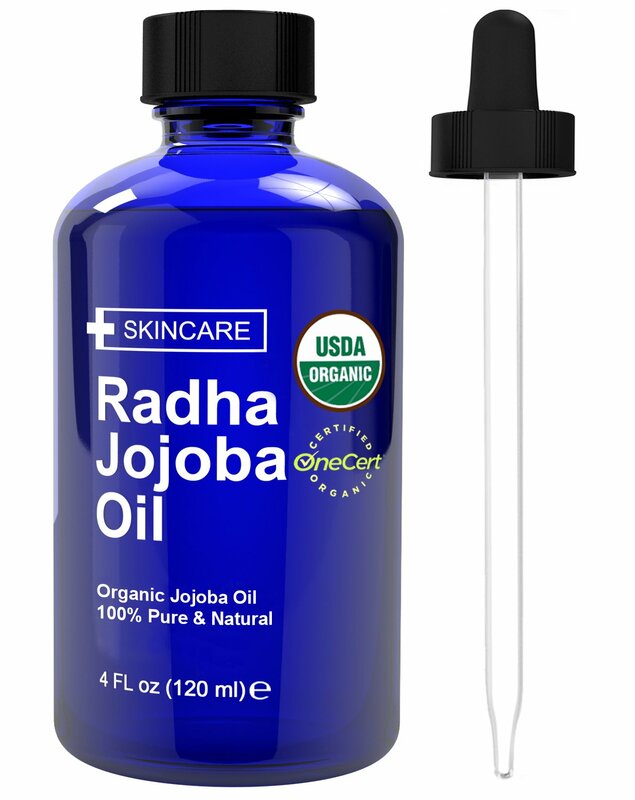 Radha Beauty sells this pure, golden jojoba oil in 4oz. blue cobalt glass bottles. Each bottle comes with a dropper lid and a solid lid for leak-free storage. The oil within is pure jojoba oil that’s been cold pressed and has not been refined in any way. It is made in the USA from locally grown plants. ​From the choices I’ve mentioned above, and based on the criteria for a great product, I want to recommend the Teddie Organics Golden Jojoba Oil. In my opinion, this is one of the best jojoba oils because of its pure state and noticeable quality. It’s nearly odorless (as it should be! ), has a great protective bottle with a dropper, and has all the characteristics of an excellent essential oil. What Is The Best Fetal Doppler For Home Use? Hi there ! I’m Anna Smith, chief editor at Healthankering. I'm a proud mother of three passionate about health tips, beauty and ways to live healthier with more energy ! We start Healthankering to provide advanced material about not only the best ways to get healthy, but also to entertain and create a great community. Welcome aboard ! Healthankering.com is a participant in the Amazon Services LLC Associates Program, an affiliate advertising program designed to provide a means for sites to earn advertising fees by advertising and linking to Amazon.com. Additionally, Healthankering.com participates in various other affiliate programs, and we sometimes get a commission through purchases made through our links. The information contained on HealtHankering is intended for informational and educational purposes only. Any statements made on this website have not been evaluated by the FDA and any information or products discussed are not intended to diagnose, cure, treat or prevent any disease or illness. Please consult a healthcare practitioner before making changes to your diet or taking supplements that may interfere with medications. Copyright 2016 by HealtHankering. All rights reserved.